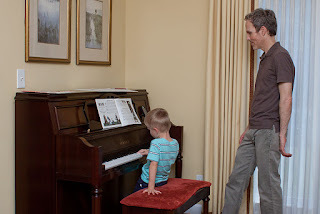 I finally found a teacher who will come to our house to teach the kids piano lessons! Sweet Pea and Little Man have theirs on Tuesday afternoons after preschool, while CC has hers on Tuesday morning before school, because her school gets out so late. Sweet Pea has taken to it like a fish to water. 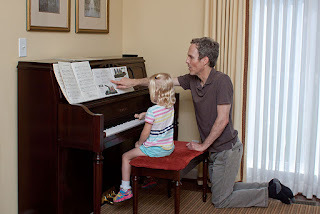 She loves to practice every day, and her finger dexterity is very impressive. This week, Mr Jimmie gave her permission to sneak ahead in her practice book, so she's excited to be in the lead. Little Man doesn't have as much patience as his twin, and he's not as interested in learning to play. But he's the most musically inclined of our kids, and when he heard Mr Jimmie play the Star Wars theme song this week, it almost made his brain explode. CC will start her lessons next week, but in the last two weeks I've taught her what her siblings have learned, so she hasn't missed much. Let's hope this is money well spent!